November 11, 2014, Hossam Sobhy, on London, @ the Egyptian National Championships, 1339 (264, 215, 187, 223, 226, 224) for 6 with new equipment, new fit and a TOPS3 thumb. I am often asked about the Positive Axis Point and how it relates to the release and ball reaction. 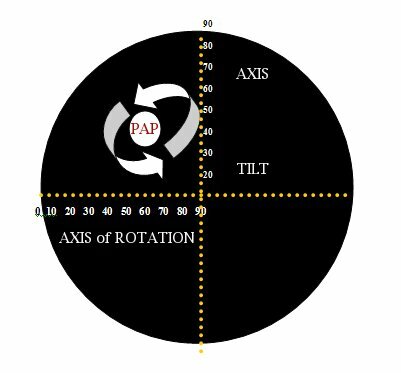 Here is a discussion about the PAP, Axis of Rotation and Axis Tilt. The easiest way to understand the Positive Axis Point is to think about our planet Earth. As everyone learns in school, the earth rotates around an imaginary axis with both a positive (North Pole) and negative axis (South Pole). The same holds true when you throw a bowling ball or any object; it will spin around an imaginary axis. Specifically, as it leaves your hand, it rotates around a Positive Axis Point (PAP) and a Negative Axis Point (NAP). In our example of the earth, the equator is the same distance from any point of the equator to each pole. 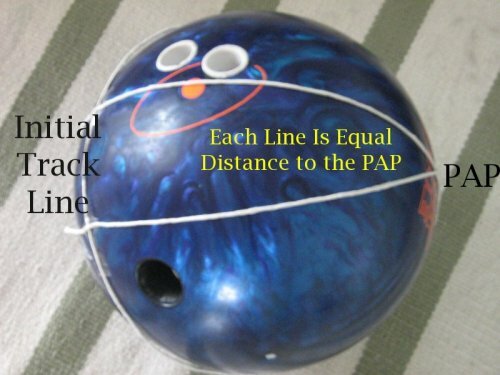 In our bowling ball example, the initial track line(oil ring closest to your grip), is similar to the earth's equator. From any point on the initial track line, it is the same distance from this line to the PAP. Similarly, the distance from this line to the NAP is the same from any point. But, the distances from the initial oil line to the PAP and NAP are not the same distance. The more tilt the shorter this distance will be to the NAP and the further it will be to the PAP. It differs for each bowler and each throw. The image below shows two lines, from the initial track line, equal distance to the PAP. In fact, all lines drawn perpendicular to the initial track line will intersect at the PAP and be equidistant. At the point of release, each bowler throws the ball with both axis of rotation and axis tilt. How you throw the ball determines how much axis of rotation and how much axis tilt. As stated above, as you throw the ball you release the ball with both axis rotation (horizontal) and axis tilt (vertical). In the image below, the ball is rotating around an imaginary axis. The position illustrates how much axis rotation and how much axis tilt exists on this throw. Like a coordinate graph. Point (2, 3) would be 2 positive units in the X axis and 3 positive units in the Y axis. In the case of a bowling ball, the axis rotation goes from 0 to 90, from the left to the center in the horizontal direction, for axis rotation. And, from 0 on the horizon to 90 in the vertical for axis tilt. Similarly, a bowler has both axis rotation and axis tilt when the ball is released. When a bowler releases the ball, the ball will rotate around an axis, as pictured below. if the PAP is marked, with a piece of tape, a bowler can see how much axis tilt (vertical) and how much axis rotation has been achieved. The only precise way to determine this is through video at the point of release. In the example below, illustrating a ball being thrown at release, from the PAP position we know that the axis of rotation is approximately 60 degrees and the axis tilt 40 degrees. As the arrows illustrate, the ball is rotating around an axis in which the pole of the axis pictured is the PAP. The NAP is 180 degrees from this point on the other side of the bowling ball and is not visible from this position. Axis Rotation is the angle in the horizontal plane whereas axis tilt is the angle in the vertical plane. As a bowler rotates around the ball more, the axis of rotation angle will increase. Specifically, the motion of the rotation is more in the opposite direction of the motion toward the pins. A ball with complete forward roll is 0 degrees of axis rotation. The motion of the ball is completely in the direction of the pins and lane. Conversely, a ball with 90 degrees of axis rotation is rotating initially 90 degrees relative to the lane. Axis of Rotation NOTE: As axis rotation increases, the length of the skid increases and the strength of the backend reaction increases. As the ball leaves your hand, it rotates around an axis relative to the horizontal plane. You can also think about this as relative to the motion of the direction toward the pins. Below is a protractor, relative to the lane, with the specific degree measures. The image below is for a right-handed bowler. This graph will help you understand the axis of rotation for a right-handed bowler and the degree equivalent. Watch closely, as the ball is released, you will begin to see the axis rotation and axis tilt with most bowling balls. With the exception of a dark colored bowling ball, you can learn to visual capture and approximate axis of rotation and axis tilt. This is a great coaching eye skill and advanced bowler skill to acquire. In general, a high axis of rotation will yield a more skid-snap reaction while a medium will be an arcy trajectory. Once again, consider matching-up the release with the ball surface. A high axis rotation with a particle bowling ball will still have more or an arcing trajectory. Whereas, if you use a reactive resin ball with a medium release, you are still likely to see more of a skid-snap characteristics. But, the key is to understand the fact that you can change the roll characteritics of a bowling ball relative to which release you use. A high axis rotation release with a particle ball is going to give you more length and more backend as compared with a particle ball with a medium axis of rotation. Axis Tilt NOTE As axis tilt increases, the length of the skid increases and the strength of the backend reaction increases.